Canadian Dodge D60 Truck in WW2. Homepage. This page: An original wartime photograph of a Canadian Dodge truck, with its driver? Hunting high and low for old photographs occasionally brings up something nice and interesting. 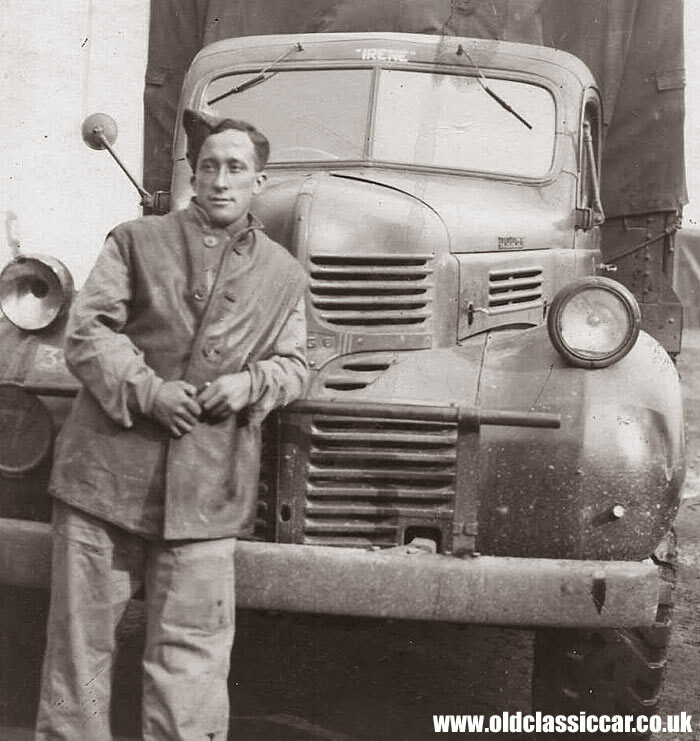 In this example, the photo shows a military chap with his trusty Dodge truck, styled similarly to the civilian 'Job Rated' Dodge trucks from 1939-1947, but with some militarised features. I don't know a great deal about these old Dodges, so if anyone can add to the info I have here by all means get in touch. Dodges serving in Europe during the war fall into two camps, those manufactured in the USA, and those in Canada. My understanding is that lefthand drive trucks were from Detroit, and righthand drive Dodges, like this one, from Canada. They were shipped over in large numbers and assembled from knocked-down kits over here in the UK. The brightwork on military trucks like this was all covered over, as can be seen with the painted grille trim and bonnet badge visible in this photograph. The lack of lens on the offside headlamp shows that this old truck had definitely been 'in the wars'. This Dodge looks like a Canadian D60L to me, which was a 3 ton, 4x2, general purpose lorry, usually fitted with a canvas-covered GS rear body. Two versions of the D60 were available, the D60S (short wheelbase) and the D60L (long wheelbase), as shown here.There was also a 3 ton truck produced by Dodge in the US, of which my VK series Dodge is an example, but despite appearances is quite different under the skin from the D60L. However both the D60L and VK shared the same basic civilian styled cab and front-end sheet metalwork, something that cannot be said for most of the US Dodges that served during WW2, of which this WC52, featured elsewhere at oldclassiccar, is a classic example. Many D60Ls also served in Australia and the Middle East I believe. This one has the name 'Irene' above the windscreen.